When do I need to book the suits for my wedding? Is there a discount available for a quantity of suits? Our policy is to keep our hire suits as keenly priced as possible so are unable to offer any discounts. Having looked at many of our competitors pricing structures, quality and service and those who offer the 'Free Suit' idea and finally comparing the bottom line price, we feel our prices are very competitive. When do we get the suits? The suits are usually available for collection after 4PM on the monday before the wedding. We need the suits for longer than one week. What can we do? When do we pay for the Suits? Contrary to what many other stores tell you no payment is needed until the fittings are undertaken, we hear so many stories of shops taking money 6/12 months in advance. 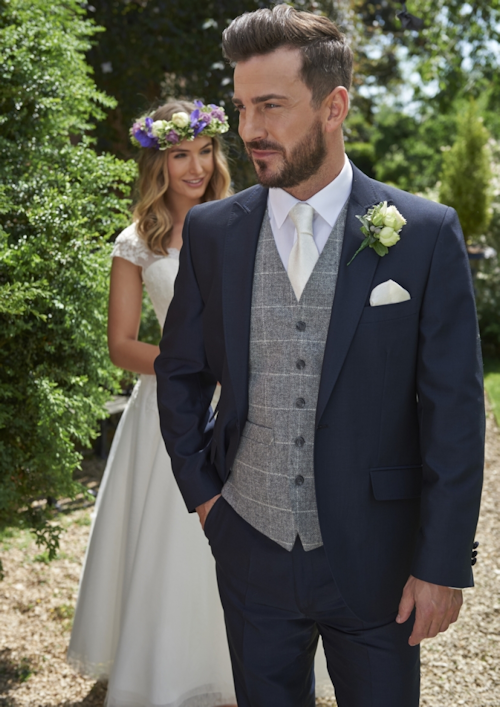 A 50% deposit is taken with each fitting with the remaining balance payable when the suits are collected. When do we do the fittings? Fittings are started approximatley 6/8 weeks before the wedding for adults and 3/4 weeks before for children and are all done by appointment which can be arranged by contacting us on (01656) 870211. We usually prefer to do the Grooms fitting first as everything is booked under the Grooms name. Do I need to bring anything with me when I come for a fitting? We like all customers to bring along a pair of shoes similar to what they will be wearing on the day, and also if he deposits aren't already paid, a 50% deposit would be needed. One of the members of the wedding party is unable to come for a fitting? No problem, sizes can be supplied to us via our Self Measurement Form, we do however recommend where possible, getting everyone measured by ourselves as to assure a perfect fit. What happens if we need to change an item? In the unlikley event of something needing changing we have deliveries from the hire company every day of the week. When are the suits returned? All the suits should be returned to the shop by 11am on the Monday after the wedding. What happens if we accidently damage an item? An 'Accidental Damage Waiver' is available to all customers at the cost of £4.90 per outfit. However, if a customer decides not to take this out and damages a garment the customer is liable for the cost of the garment.